I have lived most of my life in Farnborough, moving to the area as a young boy in 1969 having been born in Woking. I grew up cycling to and from school, cycling in and around Hawley Woods and doing a paper round when I was 13, having to cycle through those woods in the darkest mornings of winter to deliver one paper to one house. I was always aware of a small group of cyclists meeting at the Bridge around 9.30am on Sundays and thought I‘d check it out some day. In the interim decades I cycled a lot here in the UK as well as trips in North America, France, Italy and Germany, but almost always on my own with only the odd trip with a friend or two. A mixture of on road and off road, depending upon my mood of the day. Like many cyclists I became obsessed with data, throughout my rides checking how far I had ridden and how fast, what my heart rate was during the hill climbs and what my maximum speed was on the downhills. So much so, in fact, that on one British Heart Foundation London to Brighton ride I was pulled over by a police motorcyclist and almost charged for doing just under 55mph in a 30mph zone just off Ditchling Beacon. When questioned by the officer, what did I think I was doing?, I didn‘t dare tell him “trying to get 55 mph on my Cateye odometer”. I was let off with a caution and my ride into Brighton was thereafter uneventful. In 2016 I retired. I had reached 18 stone in weight through excessive corporate wining and dining and travelling the world with Time Warner. Following two prolapsed discs in 2005 I had neglected sport due to the associated pain and delayed recovery time, during which time I gained the weight. I was ready for a change. I serviced an old Trek 300 MTB with a new Brooks saddle and new tyres and decided to ride the EuroVelo 15 from the source of the Rhine in Switzerland to its exit into the North Sea at the Hoek of Holland. 1500 km and 11 days later through Switzerland, Austria, France, Germany, Belgium and Holland I finished the ride 12cm thinner around the waist and wanting more from my cycling. So, some forty years after first looking at those cyclists at the bridge, my wife nudged me to go and give FCCC its first trial. I spoke with Steve Hammatt and joined them in May 2018 for what was to be an incredible summer. How far had I ridden was all I was asked and the rest, as they say, is history. For the first few rides I was tested on the hills with the likes of Gavin Watson hanging back and motivating me at the rear of the group. 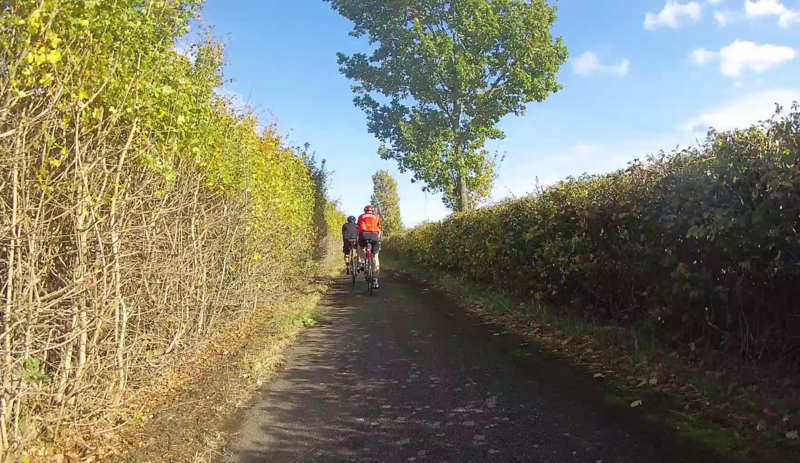 He would kindly let me hang on to his rear wheel. The thing I noticed the most was that I lost my obsession with data during the rides. We could chat as and when we wanted and I rarely looked down for confirmation of how far we had ridden, but would just make an odd check of the route if I had bothered to download the map (mainly to make sure I could reach the cafés for a bacon sarnie and cup of coffee mid-way round). I have ventured out mainly with the gentle group, but also with the mid-paced group a few times, and thoroughly enjoyed it all so much that I have ridden for every available weekend in 2018 (assuming we were not in Germany where we have a second home) as well as during the winter and in the rain. Since joining I have put some serious mileage (for me at least) consistently into my bike week after week. I am now several stones lighter (losing 14 kilos in 9 months) and have made a few new friends along the way too. I can‘t believe that it took me over 40 years to join, but I am sure glad I did and I am sure so is my wife! I realise that to make FCCC tick takes a lot of dedication behind the scenes from a rare breed of people who clearly put the club before themselves more often than I would care to count. The club nights, the web site, the meetings, the club kit secretary and the race meetings are, inter alia, all good examples of that dedication. I would like to say thanks to FCCC and its variety of members who turn out early every Sunday and Wednesday under the railway bridge for making the small membership fee one of the best investments I have ever made. See you all at the Bridge! Next PostNext Ladies Take Over!